Real Food for the Real Homemaker is a 175+ page eCookbook with over 75 whole foods recipes that are simple to make and use wholesome, familiar ingredients. 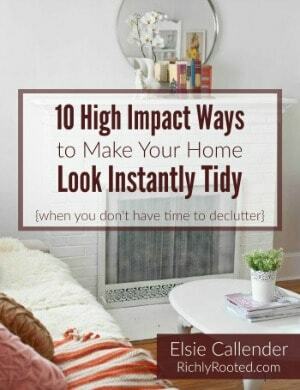 I wrote this eBook with co-authors Jaimie Ramsey and Jami of Young Wife’s Guide to bring you a resource of budget-friendly dishes that you can feel good about feeding yourself, your spouse, or your kids. When you purchase Real Food for the Real Homemaker you will not only receive PDF and Kindle versions of the book, you’ll also get printable recipe cards and an Excel database to help you plan meals and generate a shopping list for any of the dishes in the book! The first 8 chapters dive into real food homemaking with topics such as real food basics, frugal grocery shopping, must-have kitchen tools, make it yourself tips and recipes, and more! The recipes are individually introduced and are outlined with numbered instructions. Many also include pictures. To learn more about Real Food for the Real Homemaker, as well as future cookbook projects, visit our website. You can browse the table of contents, see what people are saying, and of course…buy the book! 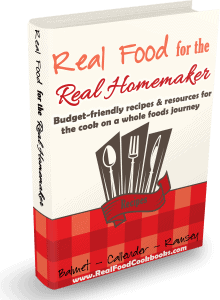 We will be releasing Real Food for the Real Homemaker in softcover print edition soon! Check back for more details!